Here’s a similar message that John Piper preached several years ago: “Doing Missions When Dying Is Gain”. This message struck me, as well. It targeted the heart of God’s servants and how our Master often exposes those things that we treasure (and long for) above or beside Him (2Kings 19). Duncan reflected on how God often withholds the fulfillment of good things, even godly desires, from His people in order to increase their joy in Him. There is much pain and suffering in the service of God, but that was the experience of our Savior and should be expected by all who would follow after Him. Those who walk by faith while entrusting themselves to God’s provision and timing will find an inexpressible joy that softens the hardships that crush our hearts. May you find comfort and strength (as I did) from God’s word as you hear it preached in this message. It’s worth your time. In his recent blog series on “The Pastor and Personal Criticism,” C.J. Mahaney unpacks many of the hidden blessings and subtle temptations that come as a result of criticism. While God uses correction to grow us in grace, the exposure of indwelling sin can be difficult to discern and destroy, except that we apply the gospel to the root of our struggles. It would do little good to attack the fruit when the poison remains buried within the root. As we’ll see shortly, the gospel contains the cure for our sinful condition because Christ stood in our place–He suffered the criticism (and punishment) that we rightly deserve and lavished on us the edification and exaltation (the many blessings) that were rightfully His. In his section on temptation, Mahaney refers to a penetrating article by William Farley, entitled “The Poison of Self Pity”. In the article, Farley describes the subtle dangers of self-pity and how various disappointments lead to displacing Christ as Lord by enthroning ourselves instead. At the root of our struggle is idolatry and pride–an exaltation of self that is evidenced by two things: (1) an inaccurate sense of “who I am and what I deserve,” and (2) a forgetfulness of who Christ is and what Christ has done on my behalf. In other words, our ignorance and spiritual amnesia manifest themselves in an inflated sense of self and personal entitlement coupled with a forgetfulness and ingratitude toward God for His grace. Self-pity forsakes the functional reality of the gospel–that we deserve death and condemnation and that Christ alone deserves worship and blessing. Yet, Christ stood in our place in order to bear the weight of our punishment so that we might be reconciled to God and enjoy the vicarious extension of His reward. In the simplest form, the cure for “the poison of self-pity” is the antidote of gospel gratitude. A right understanding of self and the saving work of Christ will produce an overwhelming sense of gratitude that will recalibrate our perspective. We will praise God rather than grumble at Him; exhibit joy rather than grow embittered; display humility and grace rather than anger and frustration. We will be God-centered rather than self-centered. We will seek to edify others instead of being consumed by our own frustrations and unfulfilled desires. Instead of seeking to be served by unloading our disappointment, we will seek to serve others by prayerfully ministering to them. 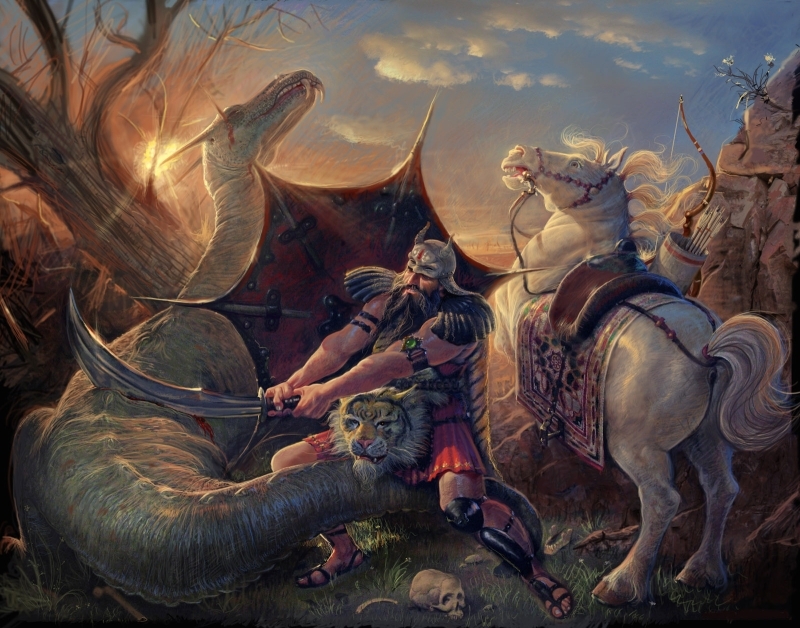 In other words, our grateful, faith-filled embrace of the gospel will slay the dragon of self-pity that seeks to devour our lives. As a man prone toward self-pity and sinful indulgence, I highly recommend both articles for your prayerful consideration. While Christ has redeemed us with His own blood, His work of curing us from self-centeredness has only been commenced; it has not been completed. It will not be fully realized until He returns. As recipients of God’s sanctifying grace, we are called to extend His grace toward others as we joyfully reflect the character of Christ who entrusted Himself to God, even while suffering the fate that should have been ours. While we may suffer hardships and experience unfulfilled desires in this life, we know that our Father is trustworthy and gracious. We know that He has given us the Holy Spirit as our Comforter and Guide, and that all things are being used by Him to sanctify us toward perfection. And, we know that Christ has lived perfectly in our place and died purposefully as our Substitute. The very ways in which we fall short, He did not; and His obedience has been credited to us–freeing us from enslavement to self-pity and uniting us to God in gratitude and grace. THAT is the sweetness of the gospel in the midst of chronic disappointment and pain. While these realities are not easy to embrace, we have a loving God who enables us to do so whenever we humbly come to the foot of the Cross and forsake ourselves in order that we might have Christ. He is willing and able to do more than we could ever ask or imagine (Eph. 3:14-21)… We must repeatedly preach these truths to ourselves and to one another, because we are prone toward self-pity, pride, ingratitude, and self-consumption. Let us trust God as He empowers us to die to self and live to Christ! Robert Murry M’Cheyne, the late Scottish preacher, who died at the age of 29 before which the great Scottish revival took place (seemingly in large measure as a result of his faithful life and preaching ministry) said, “It is not great talents God blesses so much as likeness to Jesus. A holy minister is an awful weapon in the hand of God.” May God raise up a generation of holy men and women who penetrate this dark world with the piercing light of Christ. J. Oswald Sanders, Spiritual Leadership (Chicago: Moody Press, 1994), 150-151.